Discover the South of Buenos Aires on this small-group bike tour. 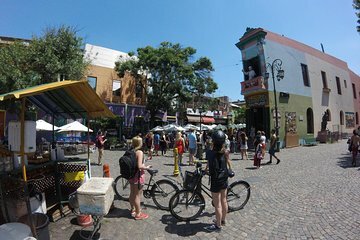 Lose yourself in the historic atmosphere of the Plaza de Mayo, the colorful streets of La Boca, the stylish modern feel of Puerto Madero, and the old-school charms of San Telmo. Visit some of the city’s loveliest green areas, and enjoy mate, alfajores, and a tasty sandwich from a local food truck.